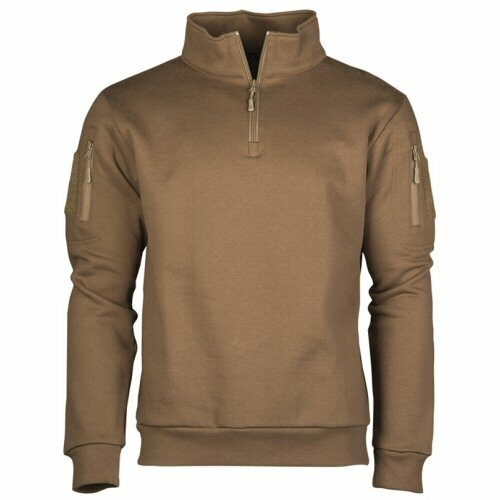 New tactical sweatshirt in coyote brown with norgie shirt features including a quarter zip, high collar, ribbed cuffs and waist. The inside is fleeced for warmth, the machine washable 220gsm fabric is a comfortable 60/40 Cotton/Polyester mix. 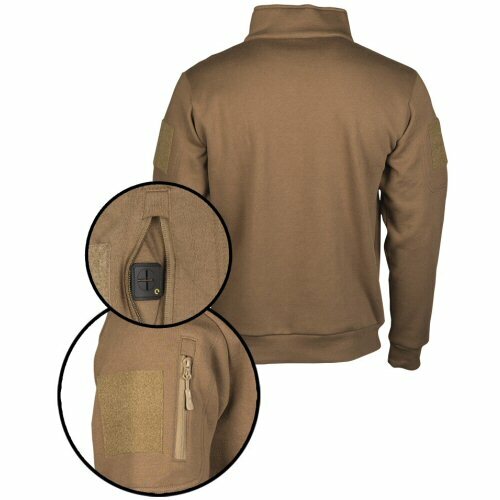 The sleeves feature a zip pocket on each upper arm which is faced with loop velcro for addition of insignia. The inside of the pocket has a loop for comms wiring to run up or down the sleeve. Sweatshirt fabric stretches for movement; soft and comfortable for wear either next to skin or as a mid-layer. Sizes L (39-40in), XL (41-42in), XXL (43-44in); L arm length 23in, XL arm length 24.5in, XXL arm length 26in. Back of shirt, and detailed view of the zip pocket and its features.